Like the flowering maples in my previous article, honeybells (Hermannia spp.) 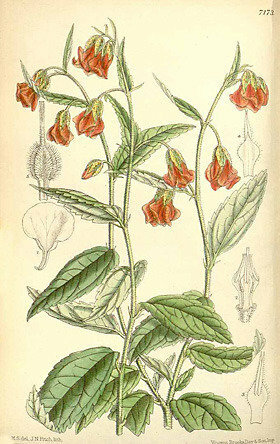 are bell-shaped members of the mallow family. 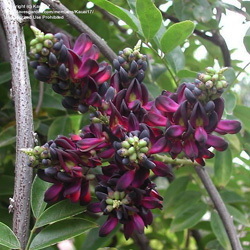 However, most of them originated in Africa, making them much better adapted to hot, dry conditions than abutilons are. Each hermannia bloom has five petals, twisted in such a way that some types resemble miniature roses when viewed from beneath--hence, the nickname "doll roses." Due to their origins, these small shrubs prefer very well-drained soil in full sun. The only type which has made much of a splash in the U. S. is Hermannia verticillata, formerly known as Mahernia odorata, which seldom grows taller than 18 inches. 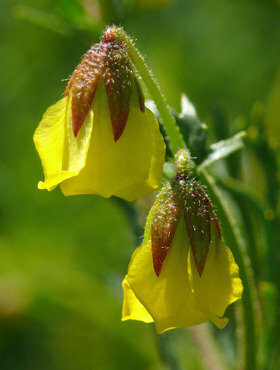 As you can see from Kelley's photo in the thumbnail, it puts on a brilliant display of sunny yellow, with feathery leaves and flowers about 3/4 of an inch wide. An 1890 issue of Vick's Monthly Magazine reports that the plant "blooms only in the winter and the early springtime, when it is completely covered with its graceful yellow blooms, having a delightful perfume. One good plant will scent a room." Some writers describe that perfume as similar to the odor of jonquils. In The Essence of Paradise, Tovah Martin holds that "Hermannia is one of the few blooms that imitate the aroma of honey. . .The scent is unmistakable, yet not overwhelmingly gooey sweet or heavy." Victorian and Edwardian gardeners liked to grow mahernia indoors, where it will flower freely from about mid-March to mid-May, provided that it receives nippy nighttime temperatures--near 45 to 50 degrees Fahrenheit--during that period. So it probably would be most suitable for those of you who have a cool greenhouse or unheated sun porch where the temperatures never drop below freezing. Martin recommends placing the plant in an 8-inch hanging basket, suspended in a bay window or other location where all sides receive plenty of sun. Eben Eugene Rexford agrees, in an 1890 edition of Home Floriculture, that Honey Bell "is a most charming little plant for growing on a bracket where its slender branches can be allowed to droop over the pot and dispose of themselves in their own graceful fashion." Those of you in the dryer areas of zones 9 through 11 probably should be able to grow it outdoors instead. 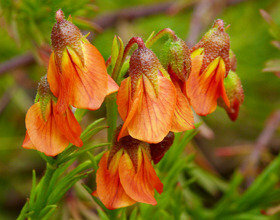 The bells of Hermannia ciliata, cristata, and pinnata all come in shades of orange and red, varying in height from 6 inches for pinnata to 2 feet for ciliata. Most of the honeybells tend toward warm hues, though a couple of the tallest--Hermannia stricta and Hermannia grandiflora, both of which have been known as desert rose--grow to about 3 feet and ring in a change in dark pink. The more diminutive windmill doll's rose (Hermannia nana) stands small at 8 inches and puts a different spin on things with mauve petals shaped like a windmill's vanes. The red flowers to either side here were identified as Hermannia alnifolia, but I suspect that may be a mistake, as alnifolia blooms are supposed to be yellow. 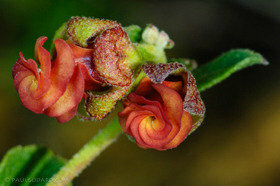 However, the photos do present a lovely example of how hermannia petals can curl into "doll roses." 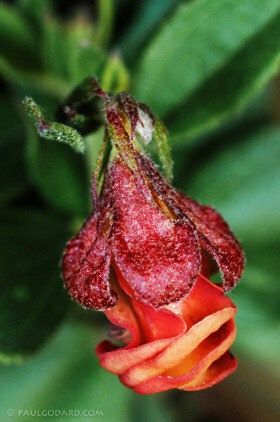 Although Hermannia verticillata occasionally is available from greenhouses which sell tropicals, acquiring other members of the family could be tricky. 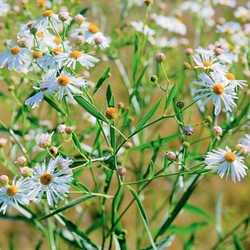 If you find these plants of interest, you may need to grow them from seed. PlantZAfrica recommends that you barely cover those seeds with damp sand or another well-drained medium, and expect them to germinate in 2 to 3 weeks. As Beate Sachse of the National Herbarium in South Africa notes in "Hermannia," these plants "have such excellent horticultural potential. 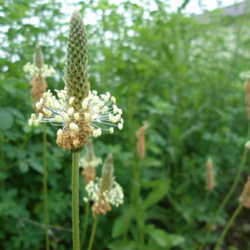 However, they are still unknown to many gardeners, and need more publicity to increase their popularity." So let's give it to them! Photos: The cropped thumbnail image is by Kelley MacDonald from the Dave's Garden PlantFiles. The other photo of Hermannia verticillata and that of Hermannia pinnata are by James Gaither, while the enhanced images of the red Hermannia sp. are by Paul Godard, all courtesy of Flickr Creative Commons and this license. The antique image of Hermannia cristata is by M. Smith from an 1891 edition of Curtis's Botanical Magazine, courtesy of plantillustrations.org.